One day I'll conquer it... And the gap jump... But as my mate broke his arm in 2 places on our last visit I've not returned. Except that sticky-outy bit formed by the rock immediately above the logo stone, could be troublesome - if I'm seeing it right. sirromj Wrote: Except that sticky-outy bit formed by the rock immediately above the logo stone, could be troublesome - if I'm seeing it right. To me that looks like the 'route edge marker' same as the sticky up stone on the R/H side of bike in that pic. 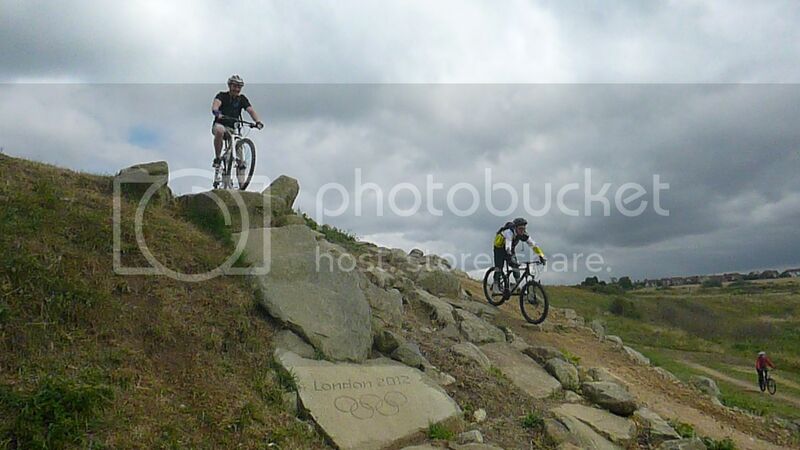 Went to Hadleigh Park today, rode around 12 miles while there. Here's my quick review. The red rock garden where the rocks are spaced out a bit, I found quite tricky going OTB on the first lap, and it actually gave me more trouble than the black sections which while being quite steep didn't cause great difficulty as they were all rollable while keeping speed in check. One exception of course being Triple Trouble which I didn't really discover until the last minute. Triple Trouble was the only black section I felt necessary to properly look at before going into. Standing at the top of the hard line on the right it looked massive. If you took it at speed it wouldn't be too difficult to clear the whole thing causing the drop to become well over 2 metres (if not 3). A guy came along and showed how it is done, but I chose to do the easier middle line instead. Another area Hadleigh left me feeling wanting was berms. None of them are particularly big and for me it was difficult to gauge the correct speed for leaving me frequently late breaking. There were also a few families with toddlers doing the red section, as well as people just standing in the middle of the trails instead of to the side. Overall I'd be very happy to have it close by as a local venue, and if you're in the area for other reasons it's well worth popping down to if you've got time, but I wouldn't want to travel from Margate without having other things to do also. It does have features which tested my ability and exposed weak areas in my riding (which felt like all of it on the first lap) and I did enjoy it, especially after pausing for a coffee and bite to eat. Here's some action replays of me flopping around like Mr Soft in the skillz area. The 3-7yr old kids loved the mini pump track and skills area.